All COUNTRY VIEW homes currently listed for sale in San Antonio as of 04/24/2019 are shown below. You can change the search criteria at any time by pressing the 'Change Search' button below. "This Charming updated One Story home with 4 Bed 2 Full Bath, backs up to a nice green belt on a large double lot. Open floor plan with two eating area and game room/multi-purpose room. Freshly painted home with new appliances, new roof, new flooring new HVAC, new water Heater and more. 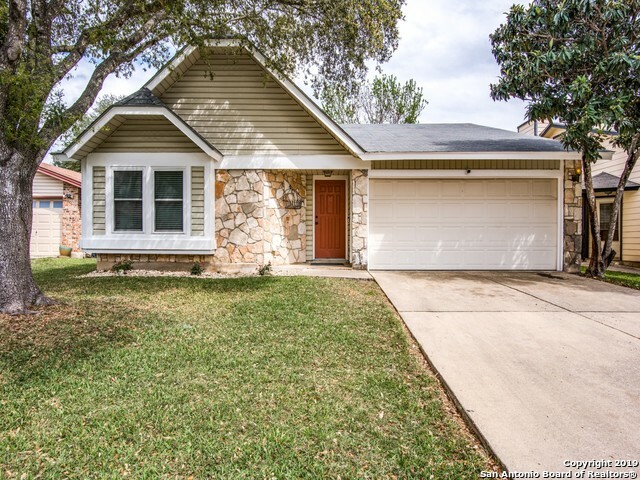 This home is conveniently located off of Babcock and inside 1604 and I-10 making access throughout the city and Medical Center, Shopping and School"
"Well maintained 4/2.5 bath home on corner lot with 2 car garage. Large living room with fireplace, master downstairs, secondary bedrooms and a large loft upstairs. Additional parking on side of home." "Everything you ever wanted and more. 3/2/2 quiet end of cul-de-sac with great neighbors. Great open floor plan. High ceilings, Bay Windows, Fireplace. Master bath remodeled in the last 5 years. Guest bath remodeled in last 6 months, new stove, interior has new paint, new carpet, Solar panels. Large covered patio with ceiling fans, Great location close to medical center/USAA/UTSA/Northside schools." "This charming updated one story home with 3 bedrooms and 2 baths, backs up to a nice greenbelt (no back neighbors). The freshly painted home with stainless steel appliances & beautiful wood floors makes it completely move in ready. The master bedroom offers plenty of space, even a sitting area! Rounding out the upgrades: newer roof & new backyard sod. This home is conveniently located off of Babcock and inside 1604 making access throughout the city easy. Close to shopping, schools and Medical "
"Master bedroom furnished for fast move-in. Solar assisted water heater. Two pecan trees, and two red oaks in this beautiful yard. New stove and energy star windows. Huge master bedroom with sitting area. New covered patio in the back yard and newer roof. Bring your buyers."